As I grew older these groups changed or evolved or dissipated. When I went to Wimbledon School of Art a whole new bunch of like-minded individuals became my confidants, my learning zone, my mentors and my friends. We saw each other every day, socialised and “hung out”. (Living and Learning with New Technology: Genres of Participation by MacArthur Foundation, November 2008). But when I moved away to university that all changed. We only kept in contact by phone or letter or saw each other when I visited home. Some friendships simply fizzled out. As my life changed so too did my friendship groups. What if we had had the Internet? How would we have reached out to others and kept these networks alive? How might we have spread our connections beyond our immediate groups? Nowadays we can reconnect with lost loves, fallen friends and past students through Facebook. I can rekindle those conversations, relive those moments and revive what made us mates again. The opportunities are even greater for connecting and maintaining those friendships and developing new ones through social networks. No longer do we seem 1000s of miles away from families and friends; with just a click of a button we can see hear and communicate through Skype, FaceTime or Google hangouts. We can see their everyday movements, what they’re watching, doing, thinking. It’s like we are still there in their lives just on the other side of the world connected by a screen. The real thrill of connecting happened when I joined Twitter back in April 2009. Back then I didn’t really know what I was doing or how to tap into the vast network out there. I didn’t use hashtags or connect properly, I just followed and read with occasional tweeting. None of my friends back home used Twitter so I decided that it would become my learning zone, eventually my support network and ultimately my PLN. But it was whilst listening to Jabiz Raisdana present at the first Learning2 conference I attended in Shanghai in October 2011, that really started the ball rolling. He shared how the Internet is a place to watch, take note connect with, collaborate and learn from. Since then, he and Keri-Lee Beasley have published an ebook A Cultural Guidebook based on Rodd Lucier’s Seven Degrees of Connectedness. During that early stage I was a “Lurker”, a “Novice” and I yearned to move up that ladder towards “Collaborator” and “Confidant”. The power of Twitter is clear the more you interact. 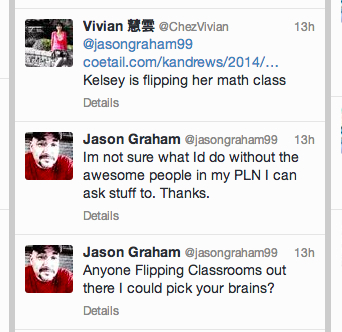 Just today, Jason Graham reached out to his PLN to ask a question about Flipping the Classroom. We reach out to others in our network for guidance, reassurance or answers. It is a powerful place and we need to participate to be part of it and keep it going. Nowadays I respond, share and connect on a deeper level using Tweetdeck to organise my many lists, hashtags and people I follow in order to dip into the conversations and take part in what is happening whenever I can. I believe that you gain more by giving more. How is your “connectedness”? What changes do you make in how you participate and respond in order to connect on a deeper level? I am energised when I talk and connect with like minded individuals. Chatting to Jane Harris over lunch, she mentioned the Sigmoid and Gompertz curves and how she was developing a leadership model that could apply to students behaviours and actions using the SAMR model. Innovators build the excitement and get the project, the group or the task underway with ideation; the Growth leaders keep that momentum going making the ideas work and the Efficiency leaders plan and deliver these to maintain the process. This same theory can apply to developing a community and how the participants are crucial in maintaining momentum and ultimately the longevity of a group. A community needs these different types of individuals to keep it alive. The innovators bring new interest and start the conversation going with new direction or ideas. This attracts the participants to join in. But without growth and efficiency the initial momentum and buzz soon wears off- how many times have you joined a group or forum or met new people only to discover weeks or months after that we had forgotten all about it as the interactions fizzled out and other matters took over. It takes time and energy and work to keep a network alive. 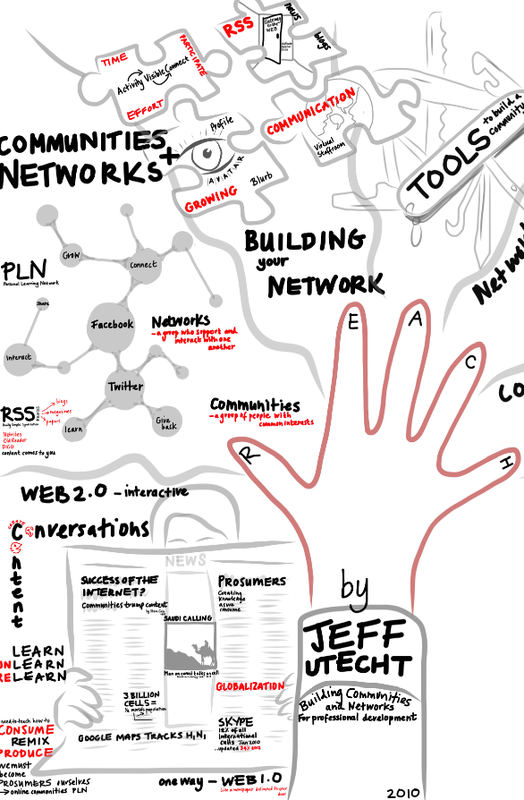 (Reach by Jeff Utecht: Building your Network). As busy educators we signed up to COETAIL knowing that we are not alone on this journey. We are supported with a backing of 100s of COETAILers who have gone before us or who are currently on the programme and who validate it’s worth not just as a qualification but for the people we will meet. As I finish, the CNY lion dance drums fill my apartment. If the internet had been around when I was in school I could have seen this spectacle live, chatted to other art students from around the world and shared work globally to grow and learn from. We take for granted the opportunities for connecting through Skype in the classroom, the lessons we can watch on TED and the blogs we can follow through the magic of RSS. Patrick Green in his keynote at Learning 2 mentions the need to be A Relevant Teacher in this world where we no longer teach just the content but how to access the content, select and synchronise. We must “help them to sift through the sea of stuff” (Welcome to the Collaboration Age, Will Richardson) and model the behaviours and actions students should take to survive in this world of digital information overload. Keeping abreast of all the information and opportunities out there is the challenge. Keeping in touch with others, connecting and building networks and utilising this new media is exciting yet time intensive. To Vivian (chezvivian) and Jason Graham I thank you for reaching to me and to Scott, Matt, Pana and Joe I salute you for taking the time to read and respond to my initial introductory blog post and joining me on this journey. To everyone else in COETAIL online2 I look forward to connecting with you and sharing the fun and laughter on the way and reading all about your journey and what you do. All these new friendships I will hold dear to me, my new community of learners, my PLN, my mentors, advisors, confidants and friends. To COETAIL online2 and anyone who has stumbled on this monster of a post and lasted until the end, I welcome you into my PLN and hope I can share with you what I gain from this experience and travel on this journey together. Reach out and keep in touch. What a wonderful post! Very reflective with lots of good connections made with your readings. There is also new information too. Thanks for the link to me! I was actually planning to “surprise” you with a visit and comment on your first blogpost but you beat me to it, with an invitation. 🙂 I’ve been a bit caught up with the rest of the world following the olympics. I’m having great fun following the olympic atmosphere with Twitter hashtags. I’m relatively new to Twitter (less than half a year) so this experience is quite new to me! Canadians around the world are using the hashtag #WeAreWinter , #GoCanadaGo , #CBCOlympics to collectively cheer on our athletes. Canadians aren’t overly patriotic people but we pull out the stops during the winter olympics. You are making great visual notes and put my doodles to shame. Welcome to Coetail. You in for a great roller coaster ride! Thank you so much Vivian! It was a bit of a long one to start with and I am certain I will not be able to maintain that level of time and input each week but it’s always good to start with enthusiasm! The Leadership idea is a new one to me too, I literally only had this conversation with a friend on Saturday, but it seemed so relevant to the reading and I thought it valid to share. Me, I’m the innovator, surprise surprise, the one who loves to get the ideas flowing and suggest new direction. Usually I have too many ideas! Snow seems a million miles away, here in hot and humid Singapore – enjoy it whilst you can! Thanks for such an informative post. I was especially interested in reading about your experiences with Twitter. I’ve been quite dismissive about Twitter in the past – in part because for me, the internet has always been a mass of content rather than a mass of connections. I’m looking forward to using it as part of my emerging PLN. In Reach, Jeff describes how a teacher uses Twitter to get temperature data from around the world to help her class explore what causes these temperature variations across the globe. I’ve done this lesson plenty of times in the past, but using data from a 5 day forecast website. I’m keen to attempt to replicate her “live” data gathering method amongst other things. Do get stuck in to Twitter, it literally has changed my life over the years – it sounds dramatic but it is truly transformative depending on how you participate. I sometimes had to ban myself so that I could get my work done or see my family! Luckily Tweetdeck prevents that madness! I was um-ing and err-ing about Planet Earth but it had to be done! Perhaps it is showing my age? I saw them a few years back in Singapore and they still rock (for oldies!). Glad you liked it! I feel like I am stalking you a bit! I am obsessed with your visual notetaking and remember being introduced to it in Beijing in 2012. I have yet to take notes visually yet. I will, I promise. Loved the Duran Duran reference, I was a HUGE fan. Also I loved how personal your post was and insightful just the same. It feels good to be able to relate with like minded people and I am thankful for twitter, Facebook and now Coetail to keep us connected. Now go grade your work!!! Thank you so much Anne. John Taylor or Simon le Bon?! I would love to work with you on a plan for visual note taking. I am currently working with Humanities and English departments in the Middle School to bring it into their learning, but it’s a gradual process. I am sure there is a potential blog post in there somewhere! So happy to connect with you and work with you here, looking forward to reading yours tonight! My RSS in Netvibes did not recognise the file from Lennox so I am hand adding them (a long process!) thinking of switching RSS – what are you using? What – we grade our work?? Love the post. It’s so fitting for a first post indeed. Isn’t that the best thing about tech? The connecting and reconnecting with people. I recall Sheldon Bradshaw saying at a conference that a learning community is like a garden, you need to tend to it to make it grow. Yes it takes time, commitment but the returns are so rewarding. Ive learned so much from my learning community, and I like the word community instead of network by the way. I know people in my community, they have become a part of people I ‘know’. People I look to for advice, knowledge and even comfort. The coolest thing? When Im honoured to meet these folks face to face. To tell them face to face how much they have impacted my learning, my life actually. BTW Ioved Patricks keynote at Learning2 last year BTW and of course Jabiz’s a few years ago in Shanghai. Jabiz is always inspiring, he got me onto to twitter (he doesn’t know that) 😉 but I started out as a lurker..
Look forward to reading more from your blog as you continue your journey. Thanks so much Jason. Funny how we were both Twitter-triggered by Jabiz! It was an inspiring keynote. I am totally with you about meeting those twitterati in person, makes the connections stronger. I am so lucky to be working with some of mine and able to connect with others through Learning 2. I love the garden context – he is a perceptive person Sheldon! Ooh I can see a visual note opportunity there…. Watch this space! Great post! I totally identify with the starting out on Twitter and how useful it was/is as a vehicle to help me learn. I am going to share your blog post with my faculty in yet another attempt to encourage my colleagues to come on board! And indeed, tweetdeck is a must for organising! Thank you Lindy, always happy to be of help. I hope you have success, I have a similar “Look what you are missing out on” with my department! It all takes time – good luck. Nicki – an interesting read – “the need to be A Relevant Teacher in this world where we no longer teach just the content but how to access the content, select and synchronise. Have you shared your COETAIL journey with your students? Told them you are learning how to better help them? I feel like I am working for credibility with my Middle Schoolers. I’ve been talking to my students about this stuff and what I think about it. It is really interesting to hear their perspectives on my journey – and their surprise that I am taking a course and continue to learn everyday. I am very excited to do some more collaboration this year using twitter and hopefully some other platforms. Analog or digital – does creation form matter if the function is creation? So true Matt! We have been advocating creativity for ever! I have mentioned COETAIL and the blog posts this week to some students as I am chatting to them about connecting and learning online. It is fascinating seeing how much they follow the “Messing about” model and that FB and Youtube are the number 1 go to places, still. Upload this weekend, reports are crippling me! Only 270 this year! It’s taking me a while to get caught up but I’m so glad I started by reading this post! I’m now frantically googling Sigmoid and Gompertz and humming “Hungry Like the Wolf” at the same time. I’m really looking forward to see how your visual notes make their way into your COETAIL reflections as they are always excellent! Ah you never cease to make me laugh! Thanks for the feedback. I think I write too much, surprisingly to me I have lots to say! The visuals are the funnest part though and consolidate my thinking. Sadly I have put so much pressure on myself to keep up with them each week! I know just how you feel when you talk about having that special group group of friend only in my car they are still in the picture today. For many years I attended a small international school in the foothills of South India. When high school came around I entered that same school as a boarding student which tightened our bonds even more. That group of kids are still my closest friends today. Like you I then moved on to art school and connected with a new group that are still in my life today. I definitely know (because am a slacker at writing letters) if I were unable to stay connected via technology these same friends would not be in my life. Thank you twitter, Facebook and Skype to name a few.